Being back from Bali, I thought it might be a good idea to sum up the outcome of my self experiment – travelling light (meaning ‘hand luggage only’) on my two-week surf and bike trip. First of all, it was great! I was a little sceptical if this would really work out the way I wanted it to be, but I have to say – it really did. It felt quite comfortable to only have to carry around the 40 litre backpack with a little less than 8kg. No more other bags to worry about. On my way to Denpasar I had to change planes in Frankfurt (Germany) and Singapore. The Osprey Farpoint 40 was the perfect choice for a trip like that. The bag fits easily in the overhead bin (and can also be squeezed under the front seat, if necessary). I carried it around as a backpack and stored the shoulder straps away before boarding (made it a little easier to put it away on the airplane). And then using the shoulder straps again before getting out of the plane for a hassle free walk from one gate to the other. Travelling Light – what’s inside? In regards to the contents of the backpack I added some packing aid on top. As mentioned in one of my previous posts, I was using three eagle creek pack-it specter cubes and two eagle creek pack-it specter sacks (for toiletries and shoes). 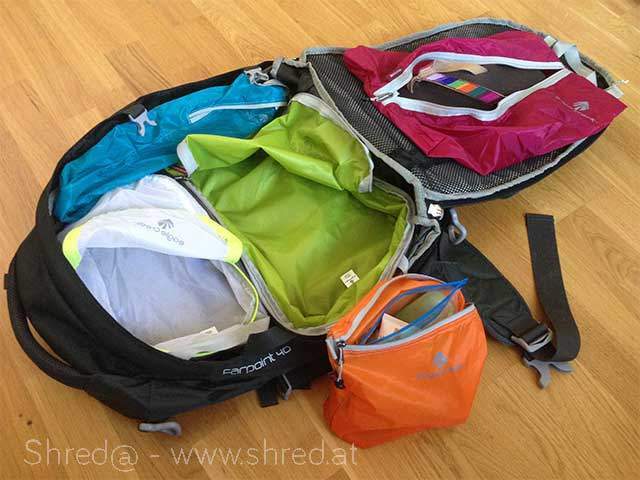 They were very useful in order to compress the clothes as well as organizing them (bike and surf gear in one bag, clothes in another, underwear in the smallest one). That also helped when I did a final check of my pack list. I have to admit that I tend to forget THINGS when travelling…the iPhone charger on one trip, hair or tooth brush on the other. But this time, I finally managed to forget 0 items…everything was there and I did not have the feeling that I missed something or that I brought to much – which was a totally new feeling. Of course I did not have enough clothing for all 14 days but since I packed a lot of functional, fast drying clothes it was not a problem at all and I either cleaned them in the sink or took them to a local laundry service that had them ready the next day. The only thing I would do differently is to take my MacBook Air next time instead of the iPad. The iPad was quite good for reading (Kindle App), short Emails and Social Media but not so much for typing up notes for blog posts, longer emails and essays. So a combination of iPhone and MacBook Air 11″ will be the perfect choice for my next trip. 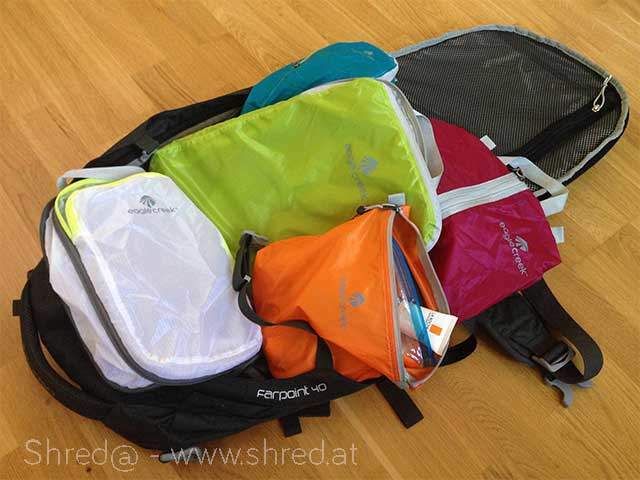 *the compression system makes it really easy to store everything in your bag. I have one for shirts, shoes, toiletries, underwear and a big one for pants and bike/surf clothing. *I love my Five Ten, but those are a good alternative e.g. if you want to go hiking or trekking as well.